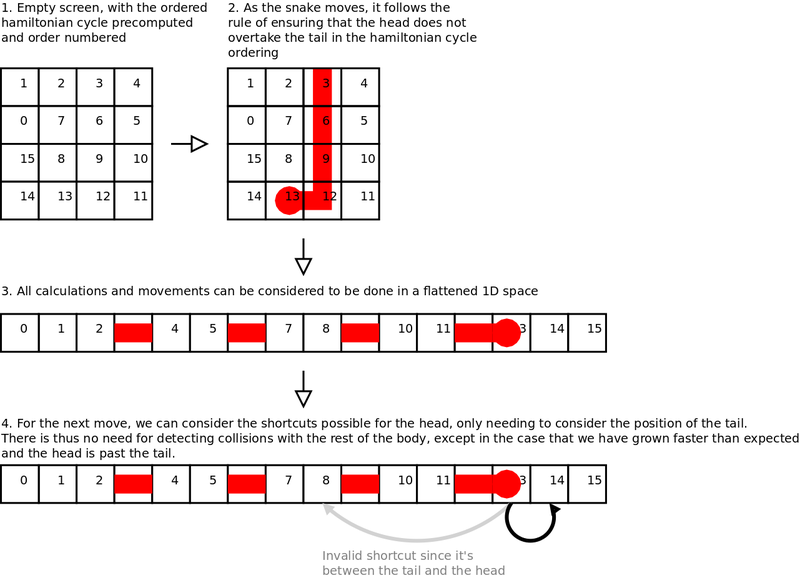 We need an AI that can play a perfect game of Snake. To collect the food without crashing into itself. But it needs to run in real time on an 8Mhz processor, and use around 1 KB of memory. The extreme memory and speed restrictions means that we do not want to allocate any heap memory, and should run everything on the stack. So what we can do is precompute a random hamiltonian cycle at the start of each game, then have the snake follow that cycle. It will thus pass through every point, without risk of crashing, and eventually win the game. There are various way to create a hamiltonian cycle, but one way is to use Prim’s Algorithm to generate a maze of half the width and half the height. 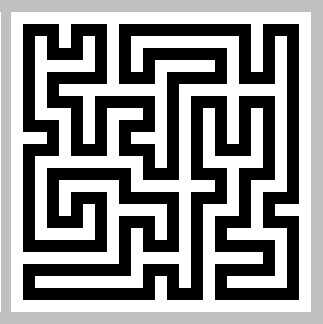 Then walk the maze by always turning left when possible. The resulting path will be twice the width and height and will be a hamiltonian cycle. Now, we could have the snake just follow the cycle the entire time, but the result is very boring to watch because the snake does not follow the food, but instead just follows the preset path. To solve this, I invented a new algorithm which I call the pertubated hamiltonian cycle. First, we imagine the cycle as being a 1D path. On this path we have the tail, the body, the head, and (wrapping back round again) the tail again. The key is realising that as long as we always enforce this order, we won’t crash. As long as all parts of the body are between tail and the head, and as long as our snake does not grow long enough for the head to catch up with the tail, we will not crash. Now, this 1D array is actually embedded in a 2D array, and the head can actually move in any of 3 directions at any time. This is equivalent to taking shortcuts through the 1D array. If we want to stick to our conditions, then any shortcut must result in the head not overtaking the tail, and it shouldn’t overtake the food, if it hasn’t already. We must also leave sufficient room between the head and tail for the amount that we expect to grow. Now we can use a standard shortest-path finding algorithm to find the optimal shortcut to the food. For example, an A* shortest path algorithm. However I opted for the very simplest algorithm of just using a greedy search. It doesn’t produce an optimal path, but visually it was sufficiently good. I additionally disable the shortcuts when the snake takes up 50% of the board. What you can see here is the snake following the zig-zag cycle, but occasionally taking shortcuts.